"Nick is a complete musician, a fine guitarist, composer, producer and band leader. The paring of instruments is impressive. This is the type of CD you listen to over and over. I highly recommend it." Guitarist, Nick Russo, winner of the 2004 International Jazz Workshop at The BANFF Centre in Canada (director, Dave Douglas) & winner of the 2001 JAS academy in Aspen Colorado (director, Christian McBride, mentioned in Dec. 2001 issue of Down Beat magazine). Leads a life of full-time performing, including performances at Carnegie Hall, Lincoln Center, The United Nations, Blue Note, Birdland, 55 Bar, Showman’s (Harlem), Lenox Lounge (Harlem), Charles Ives Center, Tilles Center, Boom, Penne e Vino, Via Delle Zoccelette, The Patchogue Theatre, Flushing Town Hall, Cleopatra’s Needle, Kavehaz, Merchants, The C-Note, The BANFF Centre in Canada, 7 weeks at Huis Ten Bosch (Sasebo, Japan), Omsk, Tomsk, Novasibersk, Akademgorodok (Academy City), and Moscow. "Nick Russo's CD "Ro" is marvelous! I think the guitar playing is terrific, I am very impressed! I am also impressed with the variety of the record. The music is unique and it's something that's needed in general because so many jazz records sound similar. I loved the Indian Raga and the banjo playing, it was very different!" 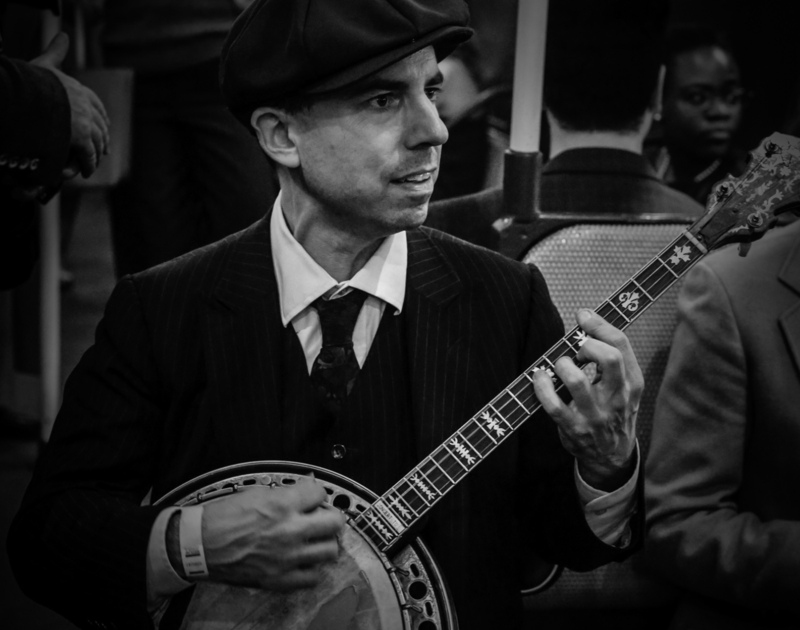 Nick Russo, guitarist/banjoist/composer has had the honor to play with Sir Paul McCartney while performing at Gwyneth Paltrow and Chris Martin’s home. Nick has performed on ABC’s “Good Morning America,” Lincoln Center, Carnegie Hall, The U.N., internationally in Japan, Spain, Brazil, Moscow, Omsk,Tomsk, Novosibirsk, Acedemy City, St. Kitts, Bermuda and Canada. Nick plays banjo and guitar for PBS Kids “Peg + Cat,” banjo for the new Home Depot commercial and appears in the Sam Mendes film “Away We Go” and PBS Masterpiece, “The Chaperone.” Nick is also the author of Metallica Legendary Licks (series 1 & 2) and editor of various guitar instructional books for Cherry Lane Music (Hal Leonard Corp.). Russo has been a sideman with John Lithgow, Antonique Smith, Vince Giordano & His Nighthawks, Bria Skonberg, Frank Vignola, Jim Nolet (Jazz Passengers), late greats Jimmy McGriff, Teddy Charles, Sonny Dallas, Joe Ascione and currently plays for Jon Batiste, NYC Ballet’s principe bassist, Ron Wasserman, Bill Charlap, Terry Waldo, Dandy Wellington, Miles Griffith’s New Ting, Gordon Au’s Grand St Stompers, New Orleans’ Aurora Nealand, Mona’s Hot Four, Dr. David Pleasant, Jon Weber, John Colianni, Victor Jones, Kim Clarke, Anastasia Rene, Mike Davis, Dan Levinson, Jesse Gelber, J Walter Hawles, Kimberly Hawkey & many others. Also, Nick recently performed with acclaimed actor Rob Morrow. Nick leads 3 bands: Nick Russo+11, Hot Jazz Jumpers and Banjo Nickaru & Western Scooches. Banjo Nickaru & Western Scooches charted as top #2 artist, #2 album on April 2018 International Folk Radio and appeared on NBC affiliate KSHB-TV, 2017 Kansas City Folk Festival main stage, Semi formal showcase NERFA 2017, Americana Fest panel, WoodSongs, Blue Plate Special, Relix, Extended Play Sessions, The Alt. Roots, Folk Alliance International, IsIs Music Hall, Club Passim, Rockwood Music Hall, Jalopy Theatre & numerous radio stations world wide, including New York’s WFUV (John Platt’s Sunday Supper and On Your Radar), WNCW (North Carolina), WMOT (Nashville) and many others. “He has a perfect sense of both harmonic and melodic artistry [he] deals in a realm of strikingly beautiful sonorities and dazzling color as well as glittering shade and delicate tones. Unique. Singular. “Beutiful CD! Nick Russo shows a highly personalized concept and musicianship and the highest caliber. This project demonstrates his great range and scope as both a composer and instrumentalist.